In contrast to Buddhist or Taoist temples, no idols are venerated at Confucius temples. The Confucian Analects clearly state that the Master never talks of prodigies, feats of strength, disorders or spirits. Therefore, only tablets can be venerated in Confucius temples. The atmosphere of Confucius temples is respectful and solemn which is in accordance with the unyielding spirit of the Confucianism. 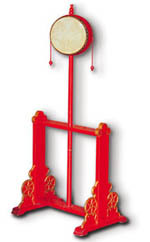 Although there are not many idols and sacrificial articles in Confucius temples, there are quite a few ritual objects and musical instruments made in accordance with ancient designs. 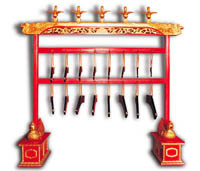 These instruments are used every year during the Confucius ceremony on September 28. A Yong bell and a Jin drum are placed beside the Yi Gate, and a set of bells, a set of chiming stones, a Te bell and a Te Chiming stone are place in the platform in front of the Da Cheng Hall. These instruments all have different pitches. There are also such ancient musical instruments as the Zhu, Yu, Se, Chinese lute, Bo Fu, Tao drum and Xun in front of the Da Cheng Hall. The Zhu is a percussion instrument shaped like a hopper, with a wide upper part and a narrow lower part. The Yu is a wooden instrument carved in the shape of a tiger, and is played by brushing the irregular teeth on the tigers back. 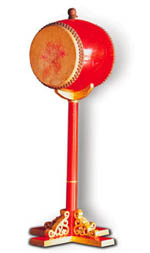 The Bo Fu is a small drum that is slapped with the hand to make a beat. 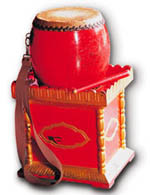 The Tao drum is a small drum with a handle under it and is played by holding the handle and shaking it, so that the strikers hit the drum and produce sounds. 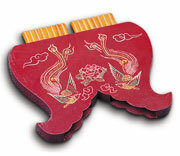 The Xun is an instrument made of clay with a flat bottom and round body which is pointy on the top. It is played by blowing into the holes on its surface. 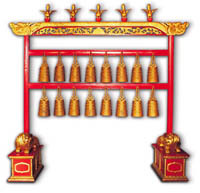 The set of bells is an instrument that is composed of 16 metal pieces Hong in two rows. The thickness of the metal is different which gives the different pitches when stroked. The set of chiming stones is an instrument that is composed of 16 curved stone slabs Hong in two rows and is played by striking the stones to produce sounds of different pitches according to the size of the stone slabs. There are many kinds of instruments used in sacrificial ceremonies, such as lungkan, lamps, censers, axes, large axes, fans, parasols, goblets, wine pitchers and discs. When worshipping Confucius, the use of instruments has to be in coordination with the music. Also, in the rites, the boys holding these instruments have to stop every five steps when walking, and show their respect to every movement. After all, the Confucius ceremony is a very solemn and important ceremony in our country. 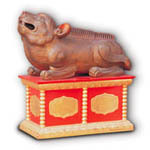 mounted on an upright post with an X-shaped base ornamented with four carved lions. a banner with tassels of silken cord Hong at varying levels, used to direct movement. a type of weapon with a handle and a honed, gourd-shaped edge. 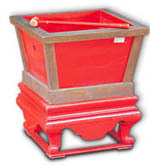 a three-legged, double-handled metal cauldron with a lid, used as a food container.